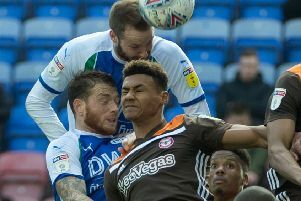 Paul Cook has revealed Wigan Athletic will be showcasing a brand new formation at Bristol City this weekend in an attempt to smash their away-day hoodoo. Latics make the long trip to Ashton Gate looking for their first away win since August 22, when they triumphed 3-0 at Stoke City. That remains their solitary victory away from the DW Stadium from 21 matches in all competitions, with 17 defeats having been suffered. Having stuck to his favoured 4-2-3-1 for the vast majority of his time in charge, Cook admits the time has come for a change with Latics looking to maintain – or even extend – the four-point buffer to the drop-zone. “We’re going to tinker with our formation – for sure,” admitted the Latics boss, whose side also travel to Hull next Wednesday. “We’re not going to keep doing the same stuff that we have been doing. “We have to do something different, for our supporters. “Hopefully that will help yield a positive result. “We all know what the away form has been like this season – as a group of players it hurts, of course it hurts. “But we’ve got two big games coming up over the next week where we can do something about that. “The season still offers so much for us. We’ve got ourselves into a decent enough position after two good home performances and results. Latics will definitely be without Michael Jacobs, who’s been ruled out for the rest of the season with a hamstring problem. That could mean Anthony Pilkington coming in as a like-for-like replacement down the flank. But it may also allow Josh Windass to partner Joe Garner up top, or even facilitate a switch to five at the back. “When you’re analysing football, you take to the field and there’s so many lad who defend, and so many lads who attack,” Cook recognised. “The best teams defend with very few, and attack with very many. “If you’re a team setting up with everyone behind the ball, you’re setting up with seven, eight, nine defenders. “But if you’re looking to win a game, what balance is correct? “As far as we’re concerned, we want to win games. “We want to travel to Bristol in the hope of winning the game. Cook also admits enough is enough with regards the away form which is in stark contrast to the side’s excellent run of results at the DW Stadium. “If you look at the away form, there’s been so many hard luck stories, pats on the back, and all of the above,” he added. “But the bottom line is we haven’t taken enough points on the road – and that’s the reality of the situation. “For the club we are and the players we have, the away form just hasn’t been good enough. “The home form is frighteningly good, but the away form is the absolute opposite. “Why that is, I think everyone will have an opinion on that.